← Success Stories - Herve B. A scope mount is one of the most important components of any weapons system and choosing the wrong one can render even the priciest rifle/scope combination completely useless. In this week&#39;s article Derek goes over the ins and outs of choosing the perfect base and/or mount for your tactical rifle. Scope mounting is a very important but often overlooked aspect of assembling a rifle. It is the connection point through which two important (and often expensive) parts of any shooting system are mated, the rifle and the optic. I’d like to take this opportunity not only to remind you how important it is to purchase quality mounts for your rifle, but mainly to assist you in deciding which options are best for you. Whether it be a hunting rifle, target rifle, or a tactical rifle; there are several things to consider when purchasing mounts. Though the basic concepts overlap, let’s look at tactical rifles. Rail is sloped forward to angle the scope down to utlilize more of its existing travel. Many rails are 20 MOA, but there are models out there with anywhere from 10 MOA to 60+ MOA. The 20 MOA slope angle is almost hard to see on this rail, with a circle being made up of 360 degrees—20 MOA, for example only accounts for 1/3 of 1 degree. There’s no strict definition when determining what a tactical rifle is, but unlike most hunting rifles, a tactical rifle has a heavy barrel, a stock designed for stable prone or field/pack shooting, and an optics system with high magnification and precision reticle. As a result of these rifles being made to shoot extreme distances, a picatinny rail with some slope is an ideal base for scope mounting. So, 0 MOA, 20 MOA, or more….what do you need? Fortunately, figuring this out requires very simple math and a ballistic calculator of your choosing. Personally, I like to use JBM’s website or my Kestrel with Applied Ballistics. For the sake of brevity and simplicity I'll only be using MOA as the unit of measurement for these calculations. Input your load data if you don’t already have it. Look at the drop of your bullet at the furthest range at which you’d like to shoot and make note of it. That number will be your scopes approximate usable elevation if put on a 0 MOA mount. You may add the slope of a rail/mount to that earlier figure to get more usable travel. Let’s get an example here. Let’s say you have a scope with 80 MOA of total travel. (80 MOA / 2) - 5 MOA = 35 MOA. The 35 MOA remaining is the usable travel if mounted on a flat rail. But what if you have a 20 MOA rail? Simple, add 20 to 35 to get 55 MOA of usable travel. Consult your data or ballistic app to see where your bullet drops to either 35 or 55 MOA. For example, my M24 .308’s drop about 35 MOA at 900 yards. So to get to 1000, I'd need to get a sloped rail. Some one piece mounts have MOA also known as slope built into them to assist in gaining more useable travel in the scope. This Era-Tac easily helps us see that visually. 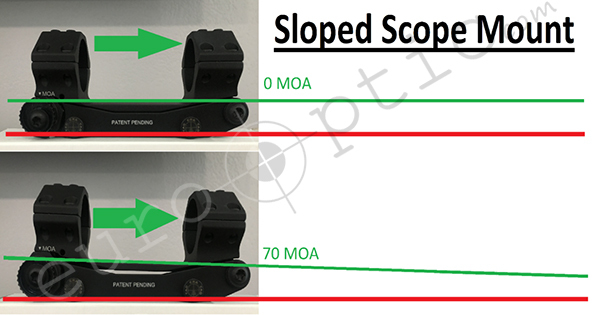 While nearly all one piece mounts will have a fixed MOA setting, usually 0 or 20, the adjustable mount above can show us what 0 and 70 MOA look like. How about we up the ante a bit? Let’s pair a .338 Lapua Magnum with a Schmidt Bender PMII 5-25. That scope has 26 mils of travel. Converted to ~90 MOA. (26 mils equates to 87.75 MOA—the 90 is for the sake of easy math in this example). The 338 Lapua Mag. is a very capable long range round and people often take it beyond 2000 yards. So how do you set this one up? Let’s go through the math. (90 MOA / 2) - 5 MOA = 40 MOA. On a 0 MOA mount/rail, you’ll be able to shoot to 40 MOA, which is roughly 1300 yards for that round, depending on load of course. 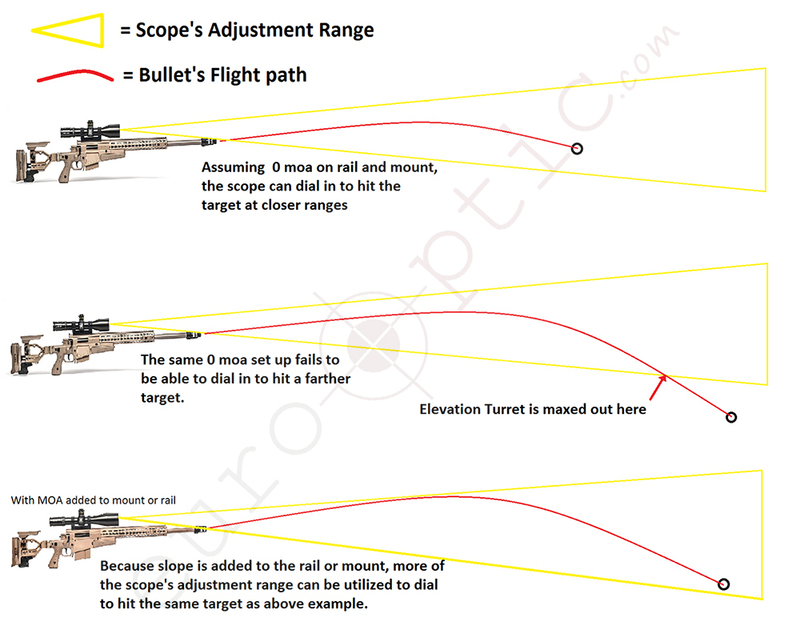 So what’s to stop you from just putting an absurd amount of MOA into the rail or mount to dial that scope farther? Well, the scope has that finite amount of travel, so if you put too much slope into the rail/mount, you’ll tip that scope forward to the extent where you can no longer get a close range zero. If you want to get a zero at, say 100 or 300 yards, you will want to be sure your overall slope on the rail/mount does not exceed half the scope’s travel. In this case, 40 MOA being the adjusted halfway point. So let’s see how far we can get with that 338 Lapua Mag. while still getting a 100 yd. zero. Whether we put a 20 MOA mount on a 20 MOA rail or a 40 MOA mount on a 0 MOA rail, we would like to get to 40 MOA as the total slope, since we subtract that 5 MOA. So 40 MOA is the adjusted half, plus the 40 MOA in the scope mount gives us 80 MOA of usable travel we can expect. For an average 338 Lapua Magnum load, bullet drops 80 MOA at about 1900 yards. To be able to dial further, more slope would be needed, although you’d start to sacrifice a closer range zero. As for the height of the rings/mount, there are some general patterns to follow. But first, we need to define what height really means. 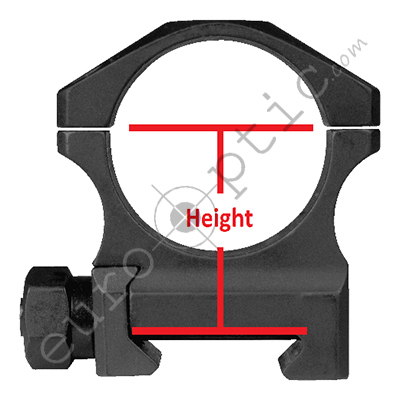 For picatinny rings or mount, height is measured from the top of the rail to the middle of the scope tube as seen below (this is also known as center-line height). A flat top rifle like an Accuracy International AXMC or AR type rifle requires a higher ring/mount than, say, a Sako TRG due to the rail on the AXMC essentially blocking the scope from being mounted in lower rings. In short, a scope with a 56mm objective is best served with rings/mount between 1.375 and 1.5” tall (35-38mm). That serves to get the scope at a height that will comfortably clear scope caps as well as the rail itself. I have seen 1.25” high rings work on 56mm on full length rail but I do not suggest it as it yields less than 1mm of clearance between rail and scope. For 50mm objective and smaller 1.25”-1.375” will be fine. Also, night vision and thermal clip on’s are typically set up so ring/mount height of 1.5” will line up perfectly, though it is generally okay if the scope is not in direct alignment. More traditional set ups like that TRG, Accuracy International AT, or other rifles who’s rail only goes over the action, not further forward, can do with lower rings. For heavy barrel rifles, a 56mm will fit in 1” tall rings. 50mm should be in about .885”, 44mm and below you can essentially go as low as you can and it’ll clear the barrel. For thin barrels, there may be a bit more room, situationally depending, but not that much. A 56mm on .885” tall will clear with thin barrels. For other rifles whose dimensions are rather unique, like the Christensen Arms MPR or Savage BA both with step-up rails, there are ways to measure to ensure your scope will fit. If you have the scope and rifle, you can accurately figure out how to determine what height is needed. Place the rifle down on its side and place the scope above it in what you’d consider the ideal height. The best ways to then measure the height is to either measure from top of rail to center of tube, or measure to bottom of tube then add the radius. For example, you place the scope over the rifle and measure the ideal spot at 0.5 inches between scope tube bottom and the rail. Convert and round that to millimeters, in this case to 13mm since most tactical scopes’ tubes are in millimeters. If scope tube is a 34mm diameter, add half that (17) to the 13mm to get 30mm ideal height. Convert back to imperial to get 1.18”. From that, you can browse the nearest set of rings or a mount that’ll be nearest that dimension. Best to go with a slightly higher one if you determined the 30mm height was absolute lowest and the 1.18” isn’t available. In semi auto rifles, like AR15 and AR10 styles, the mounting height is going to be very similar to the suggestions on the AXMC example. However, there is one extra wrinkle. For AR15 style, a cantilever mount is usually required. The reason for this is because mounting a scope for correct eye relief typically has the eyepiece right over the charging handle and the front part of the tube gets pushed out over the handguard. It is not usually a good idea to mount a ring to the handguard because it can flex a little, the ring that holds the front part of the tube needs to slant back and be secured to the receiver. That is why a cantilever mount has the forward offset. Is a cantilever mount needed on an AR10 style rifle? Not usually, due to the longer receiver, but you can play it safe by getting cantilever or take some measurement with the eyepiece over the charging handle and see where the scope’s tube ends up. For height, 1.3"-1.5" is what I suggest for 99% of scopes. The reason to not mount a scope lower, even if it will physically fit, is because an AR style rifle’s stock puts your face too high to be able to comfortably use a scope lower than about 1.3”. For rifles like the Springfield M1a, and others, there is not standard solution so use the method of positioning the scope over the rifle rail and measuring. There are some exceptions to these figures. One of which is the use of the Era-Tac Adjustable Inclination Mounts. The reason for this is when you slope a scope forward in a mount with, say, 20 moa built into it, the objective of the scope it pitched down a tad. Not an issue with 20 moa mounts if the previously mentioned suggestions are followed. The Era-Tac can go to 70, though, necessitating a higher mount to compensate. To get to the 70 moa mark on the mount while having your objective clear a full length flat top rail, best to opt for the 1.65” tall model. The other exception is for scopes with objectives larger than 56mm. Though few, they are out there. Notably, the Hensoldt 6-24x72. The objective on that scope has a radius 8mm wider than a 56mm objective scope. Converted to imperial, a mount would need to be .31 inches higher than the suggestions mentioned earlier. While these suggestions cover the vast majority of set ups out there, please remember not all rifles and scopes are the same. Scope position fore and aft in the rings/mount will matter, as well as the odd ball scopes, like ones that have objective mounted parallax adjustment. Eurooptic has a photo album on the Facebook page showing various scope, mount and rifle combos for you to browse. We would also love to have any submissions to help assist others in what fits and what will not. If you have any questions at all feel free to contact Eurooptic staff and we will get you squared away. I have a scope with a 34mm tube, 56mm objective and 127.5 moa total internal travel. I would like to mount it on a Tikka TAC A1 with a full length picatinny rail using an ERA-TAC adjustable inclination mount set at 50 moa. Will a 1.65"/42 mm high mount (SKU: T2064-0025) provide enough scope to rail clearance? Incidentally, I recently purchased an ERA-TAC adjustable mount (set on 40 moa) for my Tikka CTR from you and love it. Keefer was very helpful with that purchase. Thank you.